When I was in 6th grade, I was picked to read a poem I had written aloud at the front of my English classes. My poem was about a kid that got sent to the principal’s office, and I remember myself wishing that I’d get sent to the principal’s office myself so I wouldn’t have to read it. My hands were shaking visibly as I opened my notebook, and my voice was probably shakier still as I read it. But then… something funny happened. People didn’t even throw fruit at me. It went fine – and I realized it was actually kind of fun. Last month, I flew to a conference in Charlotte, South Carolina called FinCon, where I gave a 40-minute workshop on building YouTube channels. Two weeks from now (as I write this), I’ll be flying to a college in Vermont to do my first paid speaking engagement. Over the years, I’ve either volunteered or have been given the opportunity to speak publicly on many occasions. Through that practice, I’ve been able to calm the anxiety I felt about getting on stage, and I’ve also become an all-around better speaker. With this video/article, I’ll share some of what I learned through that experience. We’ll start with 9 specific tips that’ll help you improve your skills as a speaker; afterwards, I’ll show you some of my old speeches (one is absolutely terrible) and also point you to some additional resources. Most inexperienced speakers talk faster on stage than they realize – and it’s completely understandable. When you’re giving your talk, you’re nervous, anxious, and you’re trying to hold all the information you need to present in your head. All you want to do is get through your speech so you can get off the stage and go someplace where people can’t judge you. Unfortunately, this can cause you to rush through your speech far too quickly, which make the information you’re presenting hard to understand. Speak slowly enough that you feel a little uncomfortable doing it. Some people will say, “Speak half as fast as you think you need to,” – either way, just be conscious that you probably need to slow down. If you slow down the video, type a letter in TextEdit each time he says a word, and then paste the resulting text into a character-counting program, you get 104 words in the first minute of the talk. Yep, I actually did that. For comparison, most audiobooks are read at 150-160 words per minute. A public address benefits from a much slower rate. There’s one other thing I’d like you to note about Guy Pearce’s performance in that fake TED talk before we move on, and is the strategic pauses. Notice how he completely stops speaking at certain points, letting the silence punctuate what he just said. Use these in your own speeches; when you want to make an impact or give people time to consider an important point, simply stop talking for a couple seconds. Taking the time to make these pauses can also help you eliminate the use of verbal pauses in your speech – words including um, er, like, you know, kind of, etc. When you become used to pausing deliberately for effect, you start becoming able to do so when you simply need to think. If you paid close attention to that fake TED talk, you probably also noticed that Guy Pearce’s character employs excellent body language during his speech. Non-verbal communication – of which your body language is a large part – compliments verbal communication. Your posture, the way you hold yourself, the way you move your hands… all these facets of body language can help to refine and reinforce what you’re talking about. Body language that you’re not aware of can hurt you. Most of us have little nervous tics that we do without noticing; mine was putting my hand in and out of my pocket over and over. I’d also pace around the room too much. If you can pinpoint and eliminate the nervous tics you do unconsciously and learn to utilize intentional gestures for dramatic effect, you’ll be able to hold the audience’s attention much more effectively. When you’re speaking on stage, you’re addressing everyone in the room – each person sitting in a seat (and maybe standing if you’re really popular) is part of the audience. Unfortunately, many inexperienced speakers get nervous and fixate on one section of the audience during their entire presentation. Don’t do this. Instead, regularly move your gaze to different parts of the audience, making sure you move over the entire audience during your talk. Try to make eye contact with people all throughout the room. Now, I know this can be scary. You’re already nervous enough that you’re on stage – making direct eye contact with people can add more anxiety to the equation! Fix your gaze just above the heads of the people in the back row. These people are far back enough that they probably can’t tell if you’re making direct eye contact or not, and you can still comfortably move your head and focus on different parts of the audience. However, even though this trick works well, I challenge you to try to make eye contact with at least a few people during your next talk. Doing this gets easier and easier with practice, and it makes you seem more human when you’re speaking. …well, maybe not that much. But you should practice your material an awful lot before stepping on stage. When it comes to practice, you goal is not to do it until you get your speech right; your goal should be to practice until you can’t get it wrong. Anxiety can block your brain from making connections, but mastering your material will help you avoid that adverse effect. 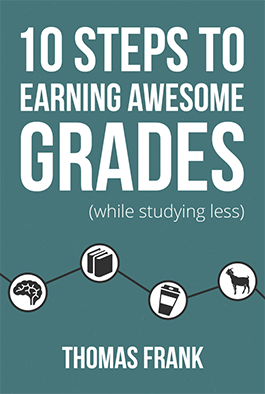 Additionally, mastery will help you cut down on a lot of anxiety in the first place. If you know exactly what you’re going to say, you’ll feel much more confident in front of the audience. I think there’s a distinction to be made when it comes to this piece of advice. To be sure, you shouldn’t write your entire speech out and try to memorize it word-for-word. Doing that will make you sound like you’re reading. However, I do think you should be able to get up on stage and deliver your speech without note cards. The way I achieve this is by writing my speech out in bullet points. Each main point, clarification, and important fact will get a bullet point in my outline. The first few times I practice, I’ll have the whole outline in my hands so I can reference it. After a few runs, though, the general outline and most of the details start to form a concrete picture in my head. At that point, I’ll practice without the outline. Eventually, I’ll know all the details of my speech cold. When it comes time to present, I might not say all the exact words I said in previous practice runs, but I’ll still deliver all the information in a confident, practiced manner. Now practice doesn’t just help with the individual speech you’re working on at the moment. In general, if you want to become an all-around better speaker, practice is once again the answer. If you’re looking for a great environment to practice your speaking skills, see if there’s a local Toastmasters group in your area. I also high recommend taking a speech class if you’re in college. Here’s a way to practice more efficiently: Bring a video camera with you and film your practice runs. For every speech I had to give in college, I did this. I’d venture out onto campus at night, find an empty classroom where no one could hear me, and practice my speech over and over again. I wouldn’t film the first few runs; during those ones, I was just trying to learn all the material. After I’d done that, though, I’d start filming each run and reviewing it immediately afterward. By doing this, I was able to pinpoint things I didn’t even notice I was doing – looking back at the slides, pacing too much, speaking too quickly, etc. Supporters – people who care about you, are invested in your topic, and want see you succeed. Bored people – those who would rather be elsewhere. Their minds are in the clouds, and whatever you do probably won’t affect them much. Notice that neither of these categories includes people who will hate you, throw rotten food at you, or summon the spirit of Hades himself and curse your family for all eternity. There’s a key realization you should have here. Your supporters are cheering you on through the good and bad; they’ll forgive your mistakes. The bored people are… bored. That means their opinions of you don’t matter. Don’t let the potential reactions of bored people cause you unnecessary anxiety during your speech. After the speech is over, you can take any constructive criticism into account for future performances. When you’re developing your speech, try to get invested in the topic and focus on the transformation you want it to have on your audience. It’s amazing just how much less scary a talk is once you focus on your audience and figure out exactly what you want to deliver to them. Once you do that, you’re no longer thinking so much about the technical aspects of your performance – your eye contact, body language, whether or not your fly is down, etc. When you’re really invested in your topic, your speech becomes almost as easy as simply explaining something to a friend in a casual setting. Yep, that’s me giving a speech to several hundred students back when I was in high school. I’m not sure if I thought I was a Beatle or something… either way, that haircut was awful. Before you step on stage, you should make an effort to dress well, to not have a stupid haircut, and to exude an aura of confidence. This is important because people form split-second first impressions upon seeing or meeting someone, and those impressions strongly influence all the future judgments they make about that person. This is known as the Halo Effect; if you’d like to read more about it, here’s an article I wrote detailing it. …so don’t try to be. Nobody delivers a perfect speech; even if you think someone did, that person can probably point out five things they feel like they screwed up on. Perfectionism will only cause anxiety and paralyze your progress, so realize right now that your speech won’t be perfect… and that’s ok. There are some bonus resources below, but before going over them I just wanted to let you know that next week we’ll be following up on this video with one on crafting great presentations. If you’d like to get notified about that video and other future content, you can sign up for the CIG newsletter. 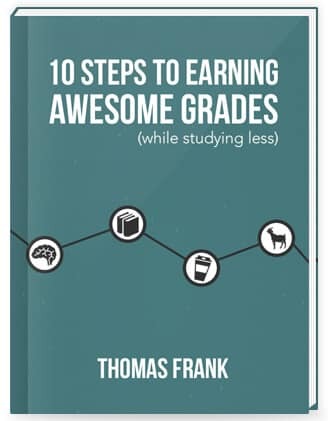 When you do, you’ll also get a free download of my 100+ page book called 10 Steps to Earning Awesome Grades (While Studying Less). Whenever I need to make a speech, I study a couple of these to look for things I can improve in my own speaking. …here are a couple videos of speeches I’ve given in the past. Hopefully these videos will convince you to just get out there and practice! The more you do, the better you’ll become. Confessions of a Public Speaker – an excellent book by Scott Berkun, which goes over many aspects of public speaking that I didn’t cover here.